If you're looking for a great (and cheap!) hotel in Vancouver, CheapTickets is the best place to find them. We offer deals on the best 294 hotels throughout Vancouver. No matter what you're looking for, we have options for you. Grab great rates on the 96 affordable 3-star hotels that are easy on the wallet without sacrificing comfort. Looking for more luxury? Try one of the 49, 4-star hotel accommodations in Vancouver. No matter your budget needs, we've pulled out all the stops to make sure you have plenty of vacation options. Maybe you prefer to search for your hotel deals based on what each hotel offers? For example, let's say you just want to find a hotel or resort that has a pool to cool off in after a long day exploring Vancouver. Scroll down to choose from the 140 hotels in Vancouver that has a pool for guests. Or search for deals on Vancouver hotels offering free wifi or breakfast, non-smoking rooms, and more! CheapTickets is here to be your personal travel agent for your next trip to Vancouver. Get booking today! What hotels in Vancouver offer free wifi access? Are there deals on Vancouver hotels offering free breakfast? Yes! The only thing better than finding a great deal on a cheap hotel in Vancouver is finding one that offers free breakfast. Grab some eggs, a waffle, or some healthy oatmeal before a day full of exploring Vancouver and all that it has to offer. Below are just some of the many hotels that offer free breakfast in Vancouver. Executive Hotel Le Soleil is a 4.00 star rated hotel property in Vancouver that offers free breakfast. 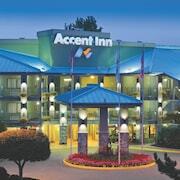 Days Inn by Wyndham Vancouver Airport is a 2.50 star rated hotel property in Vancouver that offers free breakfast. Executive Hotel Vancouver Airport is a 3.50 star rated hotel property in Vancouver that offers free breakfast. 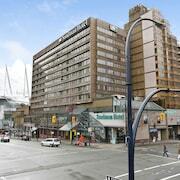 Cassandra Hotel is a 2.00 star rated hotel property in Vancouver that offers free breakfast. What about deals on pet-friendly hotels in Vancouver? Vancouver is a great place to get outside and explore with your pets in tow so don't leave your furry friends behind. Below you'll find great deals on hotels in Vancouver that allow pets. Don't forget to bring plenty of treats! Delta Hotels by Marriott Burnaby Conference Centre is a popular, pet-friendly, 4.00 star hotel in Vancouver. Comfort Inn Downtown Vancouver is a popular, pet-friendly, 3.00 star hotel in Vancouver. 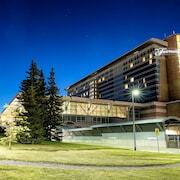 Fairmont Vancouver Airport In-Terminal Hotel is a popular, pet-friendly, 4.50 star hotel in Vancouver. Travelodge by Wyndham Vancouver Airport is a popular, pet-friendly, 2.50 star hotel in Vancouver. Any good rates on Vancouver hotels with restaurants? Absolutely. Don't want to deal with planning our all your meals on your trip to Vancouver? We don't blame you. Keep the hangry away by staying in one of the 117 hotels that have restaurants. With a room at one of these spots, all it takes to get a good meal is hopping in the elevator. Check out some of the most popular hotels in Vancouver that have restaurants below. Book Hilton Vancouver MetrotownHilton Vancouver Metrotown is a 4.00 star hotel and has one or more restaurant options. Book Best Western Plus SandsBest Western Plus Sands is a 3.00 star hotel and has one or more restaurant options. Book The Westin Bayshore- VancouverThe Westin Bayshore- Vancouver is a 4.00 star hotel and has one or more restaurant options. 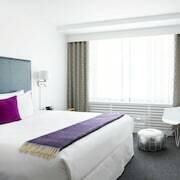 Book Sandman Suites Vancouver on DavieSandman Suites Vancouver on Davie is a 3.00 star hotel and has one or more restaurant options. What are the cheapest hotels in Vancouver with pools? What's better after a long day exploring Vancouver then a relaxing dip in a pool? Finding the Vancouver hotel you need for a bargain! Cool off and unwind at one of our 140 Vancouver hotels with a pool. Browse some of the top deals on these hotels and resorts with pools in Vancouver below, but be warned: You may not want to check out! Hotel Blu Vancouver has a pool and a 4.00 star rating. The Westin Wall Centre- Vancouver Airport has a pool and a 4.00 star rating. The Burrard has a pool and a 3.00 star rating. Executive Plaza Hotel & Conference Centre Metro Vancouver has a pool and a 4.00 star rating. What hotels in Vancouver offer parking for guests? Once you've made your way to Vancouver, the last thing you want to deal with is finding parking close to your hotel. Avoid the hassle of parking around the block and carrying your luggage all the way to the lobby by booking one of our hotels with parking. Check out deals on some of the 185 hotels in Vancouver that offer parking for guests. Georgian Court Hotel BW Premier Collection This hotel has a 4.00-star rating. The Fairmont Hotel Vancouver This hotel has a 4.00-star rating. 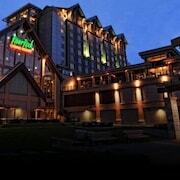 River Rock Casino Resort This hotel has a 4.00-star rating. Ramada Limited Vancouver Downtown This hotel has a 2.50-star rating. Do Vancouver hotels offer 24-hour concierge services? When you're on vacation, things don't always go according to plan. Travel with peace of mind when you book one of our 85 hotels in Vancouver with 24-hour concierge service. That way you know help is always phone call or elevator ride away. 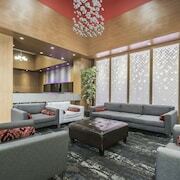 Try Executive Plaza Hotel & Conference Centre Metro Vancouver. It's a 4.00 star rated hotel in Vancouver that offers concierge services 24 hours a day. 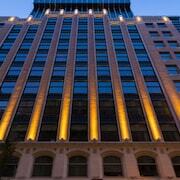 Try Residence Inn by Marriott Vancouver Downtown. 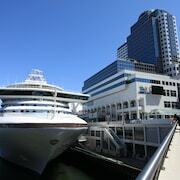 It's a 3.00 star rated hotel in Vancouver that offers concierge services 24 hours a day. Try Coast Vancouver Airport Hotel. It's a 3.00 star rated hotel in Vancouver that offers concierge services 24 hours a day. Try The St. Regis Hotel. It's a 3.50 star rated hotel in Vancouver that offers concierge services 24 hours a day. What about low rates on non-smoking hotels in Vancouver? Lonsdale Quay Hotel This hotel has a 3.00-star rating. Rosedale On Robson Suite Hotel This hotel has a 3.50-star rating. Sandman Hotel Vancouver City Centre This hotel has a 3.00-star rating. What are the cheapest Vancouver 3-star hotel deals? Our 3-star hotels bring you quality accommodations at a lower price point for the perfect, budget-friendly vacation in Vancouver. With 96 3-star hotels throughout Vancouver to choose from, you still have options. Browse our selection below. GEC Granville Suites Downtown. Located in Downtown Vancouver, this hotel is within 1 mi (2 km) of Vancouver International Film Centre, BC Place Stadium, and Canada Place. Granville Island Public Market and Stanley Park are also within 3 mi (5 km). Executive Hotel Vintage Park. Just 2 blocks from the cafés and shops on Davie Street, Executive Hotel Vintage Park is a 12-minute walk from the Granville Island shopping district. It's a 6-minute drive to Gastown, Vancouver's oldest neighborhood, now a buzzing retail and nightlife hub. The Listel Hotel Vancouver. Overlooking Robson Street shops, this elegant Vancouver hotel is 7 blocks from scenic strolls in Stanley Park and 8 blocks from the Vancouver Convention and Exhibition Centre. The Burrard. Located in Downtown Vancouver, this eco-friendly hotel is within 1 mi (2 km) of Vancouver International Film Centre, Granville Island Public Market, and Canada Place. Stanley Park and BC Place Stadium are also within 2 mi (3 km). What are the best deals on 4-Star Hotels in Vancouver? Vancouver is full of hotels and it can be hard to narrow down where you really want to stay. Luckily, we've done that hard work for you be narrowing you from 294 hotels throughout Vancouver, to the 49 4-star hotels in Vancouver. Our 4-star hotels in Vancouver are exactly what you need for your next family trip, romantic weekend, or solo getaway. Check out our most popular deals below. Pinnacle Hotel Harbourfront: This downtown hotel overlooking Vancouver's Coal Harbour, Stanley Park, and the mountains is a 3-block stroll from the convention center, cruise ship terminal, and shopping on Robson Street. Sheraton Vancouver Wall Centre: This centrally located hotel is in the heart of downtown, 2 blocks from Robson Street shops, 4 blocks from the business district, and less than 2 km (1 mi) from the convention center and Stanley Park. The hotel offers a first come, first serve complimentary shuttle directly to the Vancouver Convention Centre outside of the Pan Pacific. The Fairmont Hotel Vancouver: The iconic Fairmont Hotel Vancouver sits in the heart of downtown Vancouver, next to the Vancouver Art Gallery and a block from trendy shops and restaurants on Robson Street. Historic Gastown is 8 blocks away. Pan Pacific Vancouver: This downtown hotel on Burrard Inlet shares Canada Place with the Alaska cruise ship terminal and Vancouver Convention & Exhibition Centre. Waterfront dining, shopping, and entertainment are 2 blocks away. What are the best activities to do in Vancouver? Horse-Drawn Carriage Tour of Stanley Park: Starting at just $35 per person. Britannia Mine Museum General Tickets: Starting at just $23 per person. Wet 'n' Wild Elaho Exhilarator with Optional Vancouver & Whistler Pickup: Starting at just $81 per person. Capilano Suspension Bridge Park: Starting at just $38 per person. What are the most popular attractions in Vancouver? People travel to Vancouver from all around to witness the incredible sights and attractions. With 8 sights to see during your stay, you're sure to have a busy trip in Vancouver. Below, we've listed some of our favorites. Great Breakfast Noisy. Street noise is loud. Windows are not up to blocking the noise. Quiet, clean and located in a convenient location! Hotel cost over $350 USD for 1 night. Room key didn't work. Toilet Leaked No soap in restroom. Shower was dirty $50 go valet with very little street parking, so depending on the day you'll have no choice but to pay for valet Charged $70 USD because white pillows got dirty. I think I'll pass on booking there again. For the price go 4 seasons or Hyatt. The building has character. It's design is different than the hotels that are built today. I never usually take pictures of the hotels I stay in but I took some outside of this one. Location is amazing. The rooms are big and comfortable. Great food in their restaurant. Great staff and costumer service. Will stay there again. Nice and clean, great location. Easy to take the train from the airport, and no need for a car.